Posted on February 8, 2019 by Sara K.
This is continued from Part 2. Hey, you removed the “(Not Really)” from the title. Does that mean you’ve really started this KonMari nonsense? Yes, I have definitely started the KonMari path. I have finished selecting which socks, T-shirts, and pants I am going to keep. How many are you going to keep? 13 pairs of socks, 8 T-shirts, and 5 pairs of pants. But those numbers won’t stay fixed because a) clothes eventually wear out and b) I may choose to add to this collection. How many of those T-shits are ace T-shirts? Two of them. I was originally planning to let go of one of them because I didn’t like that it was mostly white, but instead I mixed tara powder and iron sulfate to dye it purple. I like the purple color much better, so I’m keeping it. 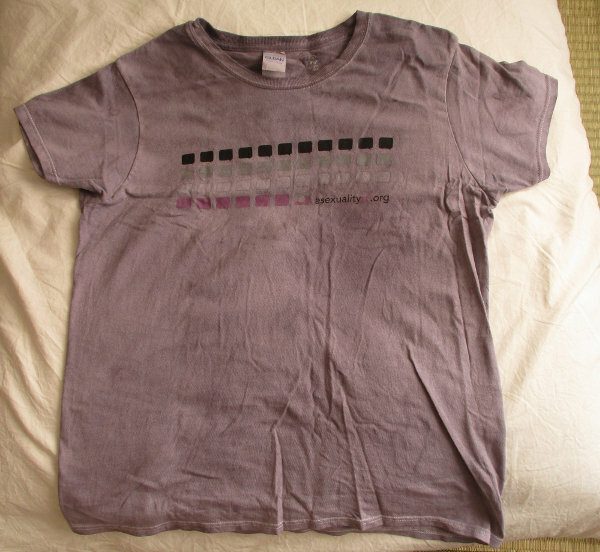 This is what the t-shirt looked like before I dyed it. 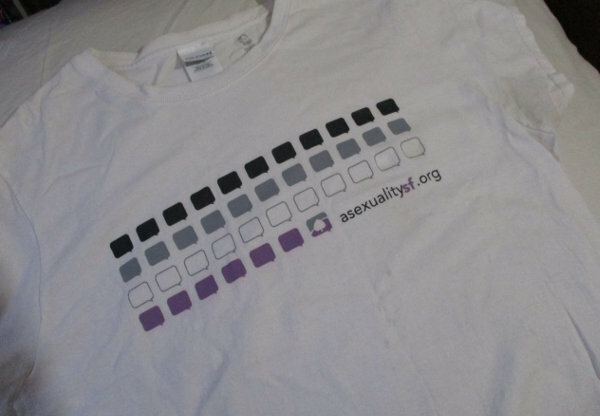 This is what the t-shirt looks like now. Posted on December 7, 2018 by Sara K.
My functionally complete comforter, partially pulled out of the linen cover. In Part 1, I described how I made my new comforter. Now, I’m going to describe how it’s working out for me. I had never worked with kapok before, so I was not sure how to stuff it. The first few chambers I stuffed relatively lightly, but then I decided to increase the stuffing to make sure they were sufficiently full. The result is that, aside from the first few chambers, they are all very full and firm. This means they are not so pliable that I can comfortably drape them close around my body, especially when I am lying on my side (I am mostly a side-sleeper). Furthermore, because I used so much kapok, and I used baffle boxes, the insulation power is great. A little too great, in fact. If I lie on my cotton futon, wear my ordinary sleepwear, and drape it over me so there is not much exposure to outside air, it’s a little too warm. ‘Too warm’ is much better than ‘too cold’, since I can drape it in a way which exposes me more to the cold air. As I’ve been using the comforter, I’ve learned how to drape it better. It really helps that I oversized the linen cover. I can excess linen drapes over me where the comforter does not, which adds flexibility. It’s colder than the comforter, but warmer than being naked, and because the comforter is too warm, it actually helps. (And linen feels so nice). In fact, this comforter is so warm that in the first week I didn’t use my cotton mattress at all. I lay down just on the goza mats (which are just above my hardwood floor), and just as the comforter is heating me up, the floor (via the thin goza mats) drains the heat away. It felt strangely comfortable. I’m fairly tolerant of sleeping on hard surfaces (I once slept on a concrete floor with just a very thin mat and a layer of polyester fabric as my ‘bed’) – the hardwood floor itself would probably be too hard for me, but the goza mats provide just enough cushioning. The main reason I need a mattress at all is for insulation, and when my comforter is so warm, the mattress is less necessary. I find the cotton futon more comfortable than lying directly on the goza mat, but temperature is more important. 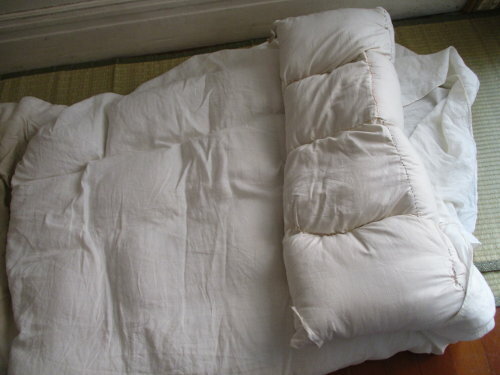 Not needing to use my cotton futon every night is a good thing, because the less I use it, the longer it will last. Furthermore, the less frequently I use it, the less moisture it will build up, which means it will be less likely to get moldy. After the first week, the weather got colder, which meant that the floor/goza mats were draining too much heat from me. Thus, I rolled out my cotton futon again for insulation. The comforter continues to be very warm, but in this weather it’s not ~too~ warm. You know how I said that my new comforter is really firm? It turns out, if I lay it down on the goza mats, and lie down on it, it feels … really comfortable. It feels more comfortable than my cotton futon. And it provides all of the insulation I would ever need from the floor. And it only has about a third of the weight of my cotton futon, which is already light for a mattress. And since kapok repels water, it is a lot less likely to get moldy than cotton. In other words, while making a comforter, I unintentionally made a good mattress, a mattress which in some ways is better than my cotton futon. (And as a mattress, it would probably be illegal to sell in the United States because a) kapok is very flammable and b) I used no flame retardants whatsoever. But making such a mattress for personal use is completely legal). The one problem with using my comforter/mattress as a mattress right now is I need a comforter to keep myself warm at night. I already gave away my old comforter to my dad, who did not like it any more than I did so he gave it to my mother (I’m still waiting to see whether my mother will keep it / use it long term). However, when the nights are warm enough than a simple blanket will do, I expect that this will become my mattress, or at least I will switch it off with my cotton futon on alternating nights. This increases the value to me because I have a great use for it on warm nights too! I also recently discovered that someone is selling a kit to make a ‘throw blanket’ out of kapok & cotton with a linen cover. Of anything available for sale, this is probably the item most similar to my new comforter/mattress. Based on the design, I’m guessing it requires less labor to make, yet less durable. It’s probably also more pliable. And my comforter is a lot longer than 40 inches (otherwise it wouldn’t cover my body or be big enough to use as a mattress). I probably did spend about 150 USD on the materials of my comforter, but that is mainly because organic linen is expensive. (If I had chosen to make the cover out of organic cotton instead of linen, I would have spent much less money on materials). (But linen feels so good that, over years of use, it’s worth the extra money). (And I notice that website is not claiming that their linen case is made from ~organic~ linen). 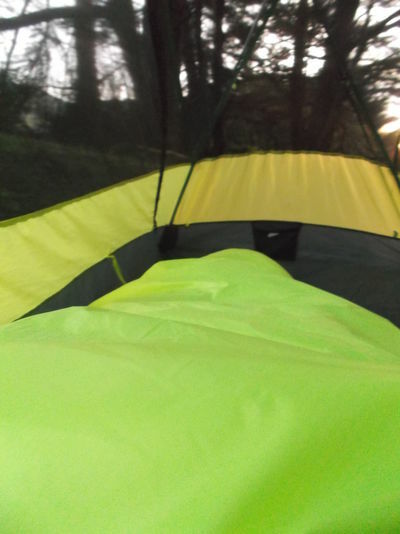 Posted on November 30, 2018 by Sara K.
Earlier this year, I got into sewing my own camping/backpacking gear, my biggest projects being my tarp, my quilt, and my net-tent which … I haven’t written a blog post about. 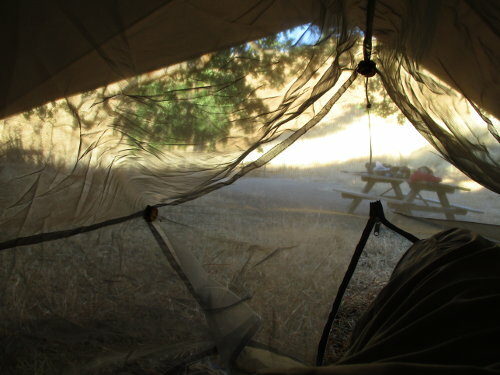 This is a picture of my right knee inside my net-tent on the first occasion I tried using it, at Sunol Backpacking Camp in Alameda County, California. I hope I will get around to writing a blog post about my net tent. 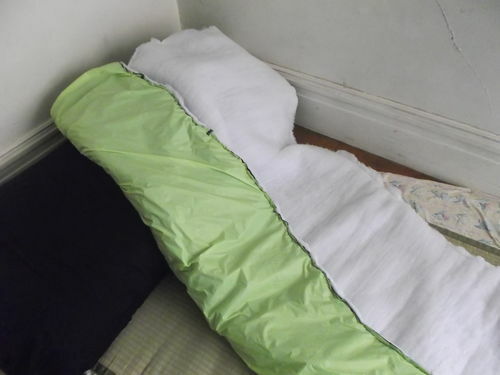 During my backpacking adventures, I got used to sleeping in a quilt which I had sewn myself. I found that it satisfies me in a way that store-bought bedding, even of the highest quality, does not. Furthermore, I didn’t like the comforter which I had been using. Winter was coming, which meant that my comforter was going to become more important. And when I was thinking of my dream comforter, I tried to find something similar to what I wanted in online stores, and could not find it. The obvious solution was to make my own comforter. That way, I would get the features I wanted *and* have the satisfaction of sleeping in homemade bedding even when I was out camping. One of the important choices is insulation. Down can be an excellent insulation, but I’m vegan, so down was not an option for me. There are many forms of synthetic insulation available, and some of them are excellent (including Climashield Apex, which is what I used in my backpacking quilt) but at home I prefer to use bedding made from natural materials such as my organic cotton futon. In particular, I wanted my new comforter to be 100% biodegradable, because no matter how durable it is, it won’t last forever and will need to disposed of at some point in the future. So, I had ruled out insulation made from animals and synthetics, and I’ve never heard of insulation made from fungi, protozoa, or bacteria, which meant I was looking for insulation made from plants. Cotton? Too heavy, lacking in loft, and moisture-absorbing. Bamboo? Not warm enough, and I’m suspicious of the chemicals used in bamboo processing. As I considered my options, the obvious choice was kapok. It is the plant-based insulation/sutffing which is most similar to down, it requires minimal processing, and since it grows on trees which don’t require herbicides or pesticides, its environmental impact is relatively low. Kapok does have to be shipped long distances from the tropical rainforests where it grows, but nothing is perfect. 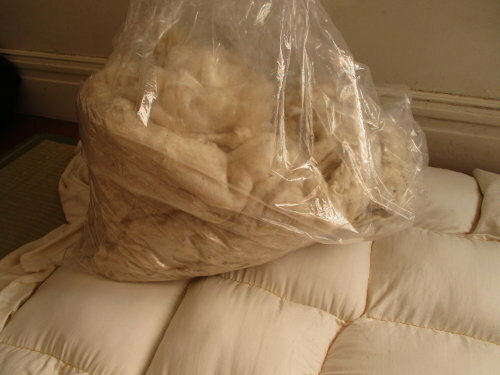 Here is a picture of a bag of kapok fiber on top of my comforter-in progress (I had stuffed most, but not all, of the chambers at this point). When I was designing my backpacking quilt, I learned a lot about the details of sewing insulated blankets (whether you call them comforters or quilts). Loose insulation (including kapok) needs to be divided into chambers, otherwise the insulation will not remain evenly distributed, and there will be major cold spots. The two major types of chambers are stitched chambers and baffle boxes. Stitched chambers are way, way easier to make, but will have cold spots (albeit much less severe than if there were no chambers whatsoever), and are less durable. Baffle boxes generally do not have cold spots, but are a royal pain in the *** to make. Furthermore, there are different ways to make baffle boxes, and the better types (i.e. the ones which provide better warmth with less insulation material and/or are more durable) are an even bigger royal pain in the *** to make. 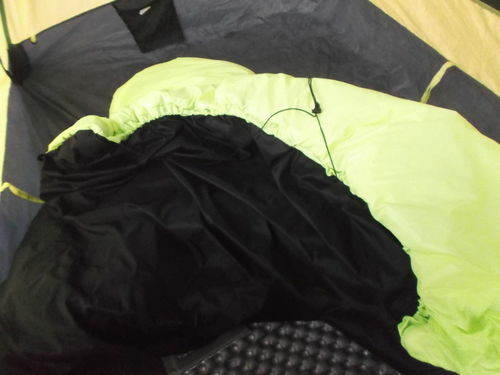 There is a (down) sleeping bag which is made in the United States which typically comes with a $600 retail price, yet many hikers swear it is the most awesome sleeping bag ever and worth every dollar. I strongly suspect that it is so bloody expensive because they invest a lot of effort in the baffles, and that is also why it is superior to other sleeping bags (not that I know from personal experience, since I’ve never used it). I decided to go with a simple baffle box design – I did not need the most perfect comforter ever, but I wanted it to be a good comforter, and I figured it was worth putting in the extra effort for durability and to make sure there weren’t cold spots. Making baffle boxes is way more of an effort than I ever expected, it at least doubled, if not tripled, the time it took to sew the comforter, but I’m proud that I did it and I have no regrets. 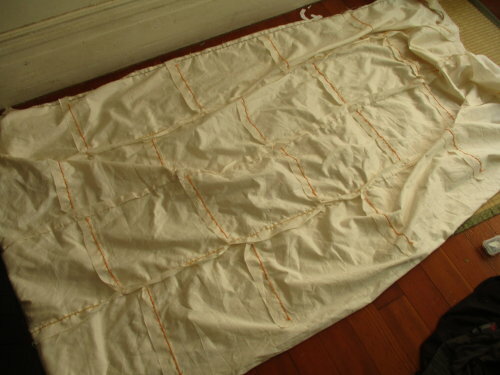 Here is a picture of my comforter after I had attached all of the baffles, but before I started stuffing it with kapok. Of course, as I stuffed the chambers, I had to sew the baffles down. I sewed the entire comforter with hemp thread. It’s biodegradable and very durable. All of the hemp ropes in the window sashes in my home is over a hundred years old, yet most of the ropes are still in good condition, so I hope the hemp thread can also last over a hundred years. The hemp thread I used is not machine-compatible, which means it was hand-sewn, though much of it would have been hand-sewn anyway because I have no idea how I would sew the baffles with a sewing machine. The fabric of my new comforter is organic cotton sateen from India. I’d never worked with sateen before, but this fabric was awesome, since working on this comforter I’ve ordered more organic-cotton-sateen-from-India for future projects. 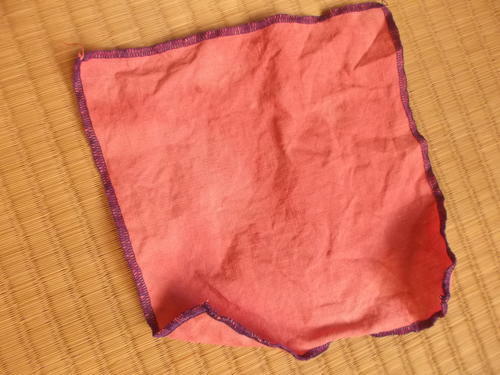 I used cotton sateen because it was a fabric which I trusted not to leak kapok. This comforter will not be washable (because of the kapok), so I also sewed a cover which can be thrown into washing machines when necessary. I decided to use organic linen, because it’s a really nice fabric which is durable and feels good and is anti-microbial/anti-fungal (i.e. it will not develop bad odors as quickly as cotton), and it has a lower environmental impact than even organic cotton. Unfortunately, organic linen ain’t cheap and, because of the low thread count, I suspect it would leak kapok (which is why the comforter itself is made from cotton sateen), but the linen makes for a wonderful cover. No part of the comforter or cover contains buttons, snaps, or zippers, because those are not biodegradeable. I did sew in some loops and tie-outs so that the comforter would not shift around too much inside the cover. I’m considering adding a few more. There were multiple interruptions in my work on this comforter (as in, I would go days or weeks without doing any work), and even when I was working on it, I would at most work on it for a few hours per day. Sewing the cover, even by hand, only took hours. In particular, I did a lot of work on this comforter during the days when San Francisco was getting all of the polluted air from the Camp Fire and I was spending more time indoors than usual. Since I was not going outside for walks as much as usual, it was nice to have a project to occupy my hands (I listened to audiobooks while sewing and stuffing). So that is how I made the comforter. I ‘finished’ it about a week ago, though I am still considering adding a few extra touches to the cover. In Part 2 I will discuss how it turned out. Posted on March 23, 2018 by Sara K.
This is a picture of my tarp in my backyard during the seam-sealing. When I started becoming concerned about the materials used in tents I eventually found myself falling into the blackhole which is known as ‘MYOG’ – Make Your Own Gear. I started working on a tarp, then quit that so I could make a quilt (which will get its own post), and after finishing the quilt went back to work on the tarp. The thing is, at the time, I didn’t have a sewing machine (I happened to get a sewing machine just days after I finished the tarp, but oh well). So the tarp was sewn by hand. Warning: sewing a tarp by hand TAKES FOREVER!!!!!!!! To sew my tarp, I used the design described in The Ray-Way Tarp Book by Ray Jardine. Yep, it’s a Ray-Way tarp. I considered buying one of Ray Jardine’s tarp kits, but decided against it because a) it’s cheaper to buy the materials separately than to buy the kit and b) I wanted to use silpoly, and the kits come with silnylon. Why silpoly? Because I made this tarp specifically with my Southern California PCT hike in mind. In Southern California, one often wants to take a siesta between 1 pm and 4 pm, yet it is sometimes difficult to find adequate shade. 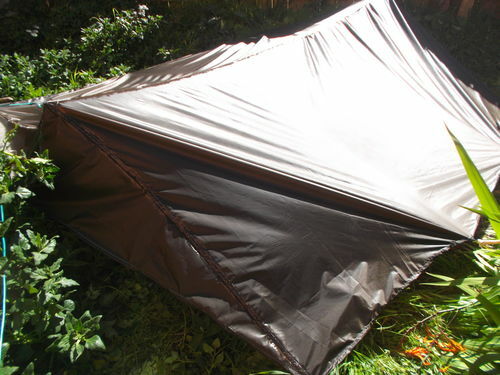 Thus, I want something which can provide shade, not just serve as a shelter from rain/snow (of course to use the tarp for shade I’d need a somewhat flat area which is free of thorny plants, but that is easier to find in the SoCal PCT than natural shade). Silnylon degrades relatively quickly when exposed to UV rays, so I would not want to leave it in the sun for hours. Silpoly degrades so slowly under UV exposure that it doesn’t matter, so it’s a much better material for a shade tarp. I know that the specific silpoly material I used is not the best for waterproofness, but I only need a tarp which can handle occasional rain/snow, not a tarp which can withstand several days of severe nonstop rain. Thus, silpoly wins. Why the brown color? First of all, since it’s a dark color, it will provide more shade than a light color. Second, black stands out too much, whereas brown blends better into the scenery. Third, it does not look like a flower (unlike my palace which has orange panels that sometimes attract bees/hornets/hummingbirds). Finally, this color was on sale, so I saved a few dollars. Did I mention that I sewed this by hand? I used backstitches for everything because the backstitch is the strongest of the hand-stitches. Maybe it’s even stronger than a machine straight stitch. Another picture of my tarp in the backyard during the seam sealing. What I found is that trying to sew a camping/backpacking tarp by hand is like trying to walk across the entire state of Washington by foot. First of all, using a sewing machine would have been way faster, just as pretty much any other common mode of transit (bike, train, bus, car, airplane, boat) would have been a much faster way to get from Oregon to British Columbia than travelling by foot. Sometimes, when sewing the tarp, I was overwhelmed by how much more sewing I had left ahead of me, just as at times I was overwhelmed by the idea of having to walk another 400 miles or whatever. Yet if you keep at it, one stitch at a time, or one step at a time, one will reach the goal. Just as I had to mentally break up my long walk across Washington into chunks (no, I’m not going all the way to Canada, I’m just going to that tiny town which is thirty miles ahead), I had to mentally break up the sewing into chunks (I’m just trying to sew this one seam, okay, not an entire tarp). One advantage of making this tarp entirely by hand (well, okay, I didn’t make the materials by hand) is I will now be very skilled at repairing tarps (and tents, since the same skills I developed by making this tarp could also be used to repair a tent). I almost always carry a small sewing kit when I travel, which is all I need for a hand-sewn repair (unless it’s a repair which requires sealant, but the very small risk that I might need the sealant for a repair does not justify carrying it). Of course, one major difference being going on a long walk and sewing a tarp is that sewing is a lot more monotonous. When I’m on a long walk, unless it’s a zero day, I’m somewhere different every day. Meanwhile, while sewing the tarp, I was sewing the same stitch over and over again, making the same type of seam, using the same materials. I would have been bored out of my mind – if I were not listening to interesting audio while I was sewing. What did I listen to? A few different things. Sometimes I listened to a song or two (especially at the beginning of a sewing session), on Martin Luther King Jr. day I listened to a couple of MLK speeches, I listened to Bi Any Means Podcast #133: Atheism and Asexuality with Emily Karp, but mostly I binged on two podcasts – Sounds of the Trail and Trailside Radio. I managed to listen to the entire archive of both of those podcasts while I was sewing my tarp (and my quilt, but trust me, the quilt took a lot less time to sew), which gives you an idea of just how much time it takes to sew a tarp by hand. Those two podcasts were two of the best things I could have listened to during my sewing, since they talk a lot about what it is like to hike on the Pacific Crest Trail, and they reminded me why I was sewing my tarp. However, after SEWING FOREVER, I did the seam sealing, and then my tarp was finally finished. Even though I did not quite follow the instructions (there was no way I was going to be able to do the seam sealing in a place without wind, for example), the sealing turned out okay. That said, if I ever make another tarp or a tent, I’m going to choose fabrics which are compatible with seam tape, since I think I’d rather iron on seam tape than mess with silicone sealant again. The final weight (including guylines and seam sealing) is 15 oz. / 0.43 kg. Yes, I made it a 2-person tarp, because my experience with camping is that, even as a solo person, it’s better to use a 2-person shelter, and it’s only a few extra ounces. Before taking this tarp out on a long trip, I wanted to test it. So I did. On the night of February 28, I went out to Point Reyes, hiked to Glen Camp, and spent the night there. It was perfect timing, since that was the rainiest night we’ve had all year so far, in was about 40-42 degrees F / 5 degrees Celsius, I was in a forest miles from the nearest parking lot (or house), and I was the only human at the campground, and I was WARM AND DRY HA HA HA HA HA HA!!!! There is something very satisfying about being in a shelter you made yourself, cloaked with a quilt you sewed yourself, on a cold and rainy night, and it being enough. That said, since I was in the forest and not at one of the ocean-side campgrounds, I did not have a problem with wind – that could have ruined my night. Sadly, my camera malfunctioned, which is why I don’t have any photos of my tarp at Point Reyes. Oh well, I have the memories. And if you want a video of a different Ray-Way Tarp in the rain, there is this video. 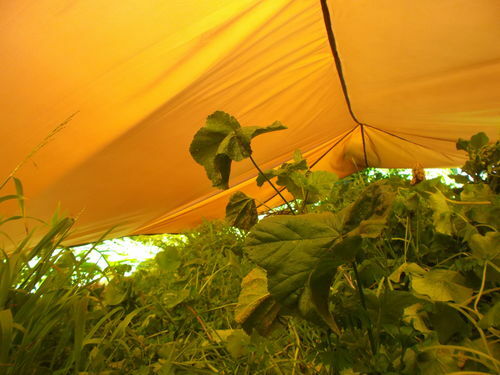 This is what my tarp looks like from below, in my backyard (when I’m in the backcountry and not in my backyard, I’ll be more careful to pitch it in places where I won’t be disturbing tender green plants). One of the various reasons I want to at least try using a tarp for a while is that a lot of people say that it changes one’s relationship with the environment. 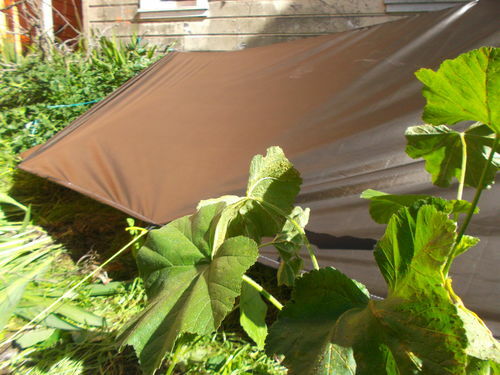 A tent seals one off from the environment, whereas a tarp lets the environment in. Tents hide you (and provide privacy!) while not letting you see what’s around you, whereas tarps do the opposite. 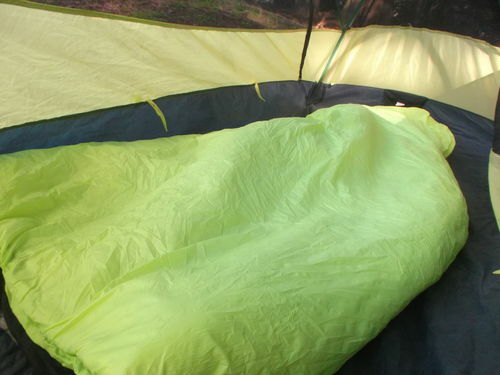 Do not get me wrong, I like the sealing effect of tents, if I’ve been in the backcountry for days I like being able to withdraw into my own cocoon and and take a break from being ‘outside’. It can be an important psychological comfort. But I think I’m ready to live without that comfort, at least in areas which do not have bug problems. I definitely felt the effect of still having a decent view of the (dark) forest while I was under my tarp, and I’m glad I tested it on a night when I had the campground to myself and privacy was not an issue (it is very rare to be alone at local campgrounds, so on future local camping trips I will probably still use my Taiwanese tent). Person: So you could return it if it didn’t work. Me: Actually, I can’t return it because I made it. Me: I mean, because I made it myself, I couldn’t read online reviews to find out whether or not it works in the rain. And there’s no warranty. Though I can repair it myself. One of the park rangers asked me to email pictures because she had never even heard of anyone making their own camping shelter before. I ate lunch at the Kule Loklo, where I met another park ranger. She was also impressed that I had made my own tarp and was ‘self-reliant’. I replied that I wasn’t as self-reliant as the Miwok people had been before Europeans came, and the ranger replied ‘very few people in the modern world are as self-reliant as they were’. At the time this post is scheduled for publication, I’m hopefully in the middle of my Southern California Pacific Crest Trail hike, with this very tarp. I probably will only deal with rain/snow for a few nights at most, and will be using this tarp for shade more than anything else, but who knows. Actually, I got a chance to test the tarp in a snowstorm and I am not hiking at the time this post is published. This is also the 500th post published on this blog. Writing 500 blog posts definitely takes way more time than even sewing a tarp by hand, though at least I spread the blog-writing time out over years. Posted on March 16, 2018 by Sara K.
Well, not quite. Because of the lighting, the cloth in the above picture looks slightly orange-pink, but in fact (at the time I took the picture) it was bright white. I had recently be readings about natural dyes. Most dyes used in the United States these days are synthetic, and many are toxic or have a negative impact on the environment. Meanwhile, if one has a source of clean water and a way to boil water, using natural dyes is surprisingly easy. I decided to try a camellia dye because it seemed very straightforward. There are many camellias blooming in my neighborhood at this time of year. It would have been cool to take camellias from my next-door neighbors, but unfortunately their bush is barely blooming at this time. 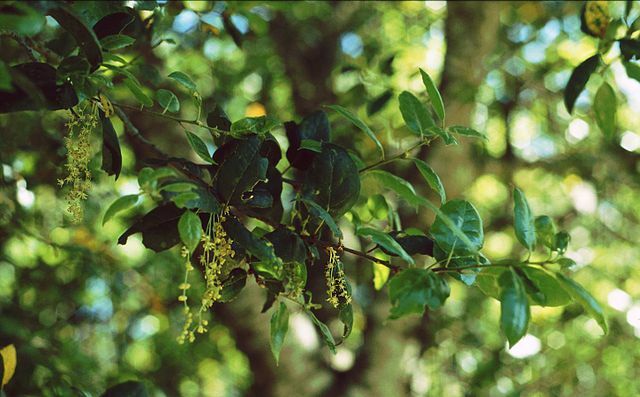 Instead, I went further from my home to a camellia bush which was in full bloom, and I took some flowers. Did I ask permission? No. But I specifically picked the flowers which were beginning to wilt and left the immature flowers and flowers at their prime alone. I daresay the camellia bush looked nicer after I removed the post-prime flowers. No, I wasn’t stealing camellia flowers, I was spontaneously volunteering to groom their camellia bush to make it look nicer (until the next set of flowers starts to wilt). I pulled apart the petals in a pot, filled the pot with water, added salt, and started boiling. Meanwhile, I soaked the linen cloth in a solution of 4 parts water and 1 part vinegar. This went on for an hour. After I finished boiling the camellia petals, I added some fresh-squeezed lemon juice, strained out the camellia petals, rinsed the linen cloth from the vinegar solution, and put the linen cloth in the camellia ‘dye bath’. I put it to a slow boil (i.e. instead of putting the fire at full blast, I kept the fire low and it let it boil gradually, though since the dye bath was pretty warm it did not take long). I then let it simmer for about an hour, and then let it sit in the pot for a second hour. After all that was done, I took out the linen cloth, and rinsed it with cold water. It came out darker and redder than I was expecting (I was expecting a pink color), but that’s fine. This is so cool that I will probably end up dying more pieces of cloth just to see what colors I can get. 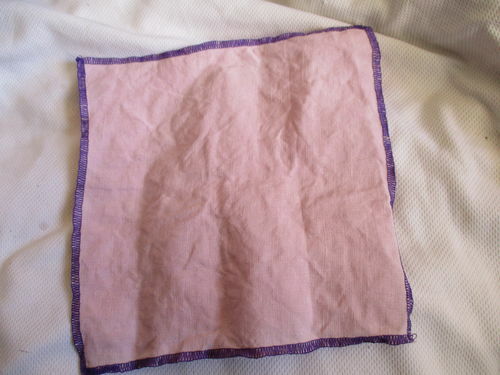 A piece of cloth dyed with lavender – rose – lemon. I wonder why the dye recipes say to use lavender and rose TOGETHER and not separately. Do the chemical compounds in lavender and rose react to each other in a way which creates the dye? 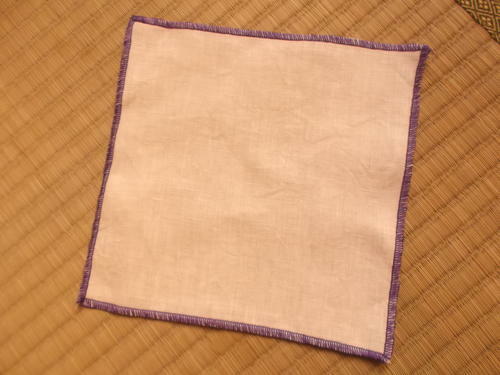 I guess if I wanted to find out, I could always try to dye cloth only with lavender-lemon or only with rose-lemon. Posted on January 26, 2016 by Sara K.
So, what did I get out of this labor-intensive exercise of gathering and preparing acorns for consumption? Well, first of all, it made me look at my surroundings in ways I had not before. Even though I grew up around oak trees … I never even really thought about the fact that they were oak trees, let alone try to observe them. However, once I got it into my head that maybe I should try gathering acorns, I started paying way more attention to the oak trees which have been there since before I was born (actually, they may have been there since before my grandparents were born). I finally made seemingly obvious connections such as, hey, this is a major food source for the local squirrels and scrub jays. 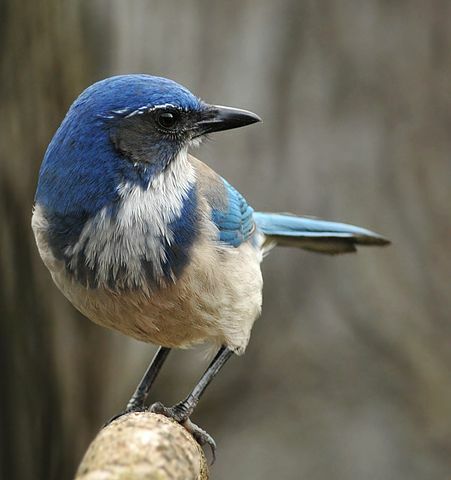 In fact, as I was watching the acorns ripen, I felt a bit of competitive heat with the squirrels and scrub jays – I was concerned they would take all of the good acorns before I could (as it so happens, there are plenty of acorns for everybody). I also looked out for oak trees wherever I went during the acorn season. I noticed that acorns in Santa Cruz and Niles Canyon were ripening faster than in San Francisco, which is why my first harvest was from Niles Canyon. I noticed there were two species of oak trees in Niles Canyon, but only one was producing acorns – I don’t know whether I was simply out of season for the other species of oak tree, or whether the climate in Niles Canyon simply is not right for acorn production in the other species (which makes one wonder how it could reproduce in the canyon). Furthermore, many of the acorns from Niles Canyon had been infested with acorn grubs (larvae of a beetle which feeds on acorns), whereas I have yet to find any signs of acorn grubs in the San Francisco acorns. Granted, I won’t know for sure until I start shelling the San Francisco acorns, but it is interesting that the San Francisco acorns both ripen later and seem to be less (or not at all) afflicted with acorn grubs. “Quercus agrifolia acorns Mount Diablo” by John Morgan from Walnut Creek, CA, USA – Acorns. Licensed under CC BY 2.0 via Wikimedia Commons. At first, I had hopeful notions that I could turn this into a real source of food. Some approaches to living in harmony with our ecology (for example, permaculture) strongly encourage getting food from trees since trees contribute more to the ecological system than, say, cereal grains, tree-agriculture does not require tilling the soil, etc. And as it so happens, some of the best examples of societies which managed to sustain itself for 10,000+ years without agriculture at relatively high population densities by getting much of their food from trees are … the indigenous societies of California, who had lived right here in what is now the San Francisco Bay Area. California, as you may know, is going through a major drought, and for some reason commercial nut trees (such as almonds) require a lot of water. 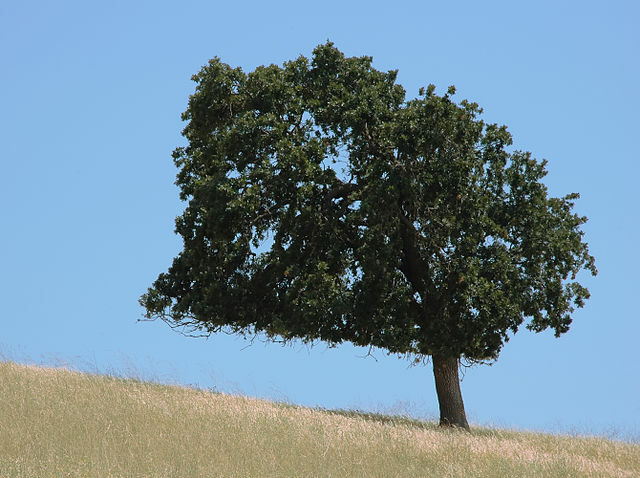 However, these oak trees are doing okay and producing acorns without irrigation – in fact, oaks are so common in California partially because they are drought-tolerant. 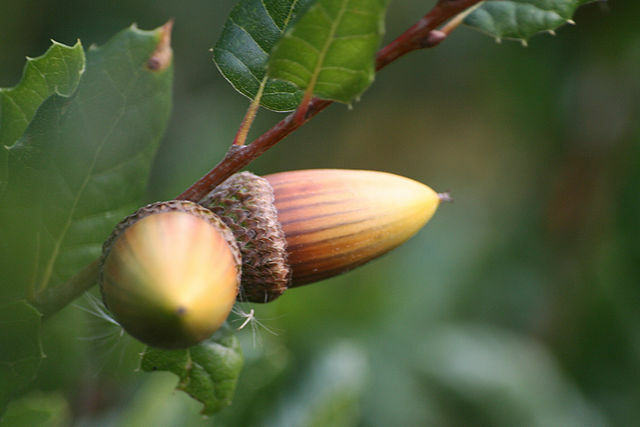 A number of people who are looking for ways to get food in ways which do minimal harm to the environment have been paying attention to acorns … and I wanted to see how practical it would be for myself. “Lone tree on a summer hillside” by Jon ‘ShakataGaNai’ Davis. Licensed under CC BY-SA 3.0 via Wikimedia Commons. Well, given the way our economy is currently set up, DIY acorn gathering does not make a ton of sense. It simply takes too much labor to shell and leech the acorns. Granted, there are machines which could do the shelling for me … if I were will to invest a few hundred dollars, which I am not. Leeching is actually not so much of a labor issue – for example, one trick used by modern-day indigenous people is to store acorns in toilet tanks and let the leeching happen automatically every time the toilet is flushed – but it just takes a lot of time/water to do it, and if you want to preserve the oil/starches, it gets more complicated. Of course, it only seems like a lot of water because I got to observe all of the water used in the process. 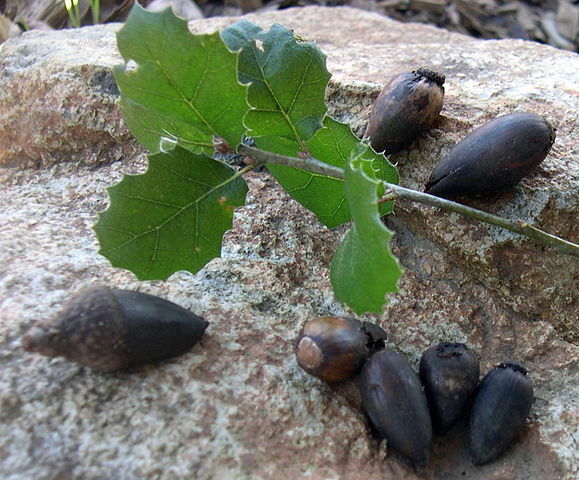 Considering that the oak trees don’t need any irrigation, producing edible acorns actually requires less water than producing edible almonds. However, 400 years ago, people in the San Francisco Bay Area would not have needed money, nor would they have had ‘jobs’. They would have had plenty of time to do the gathering, grinding, leeching, and cooking, especially since they did not need to expend any labor to care for the oak trees themselves. And it was a social activity for them – I know shelling acorns would be more fun if I could chat with people I liked while I did it. “Quercus agrifolia 2” by Franz Xaver – Own work. Licensed under CC BY-SA 3.0 via Wikimedia Commons. It feels satisfying to have participated physically in activities in some ways like the activities of those people from that older economy. It also feels satisfying to participate in the processing of my food from when it comes from the plant to when it appears in my mouth – and experience I have up to now only had with fruits and vegetables. Maybe I’ll get better at processing acorns, or at least find less labor-intensive ways to do it, in which case it may become a semi-regular part of my diet. But even if it doesn’t happen, it was definitely an educational experience.